Bill Stowe, the founder of Indian Creek Winery, was bitten by the wine bug while stationed in Germany, where he worked part time work at a German Riesling producer. When he returned to his native Idaho in 1982, he planted Stowe Vineyard in the Snake River Valley. Bill worked to gather as much climate and geology data as he could to make the most informed decisions in what has proven to be a vastly varied growing region. The Snake River Valley is a high desert growing region with a fair bit of elevation; anywhere between 2,500 and3,000 feet. This inland region relies on the elevation to give it the cooling effect that the Pacific Ocean air cannot. It's a region with drastic diurnal temperature variation, meaning the temperature changes hugely from day to night; in the Snake River Valley it's not uncommon to see a 40 degree swing. And it's that special combination of conditions that make the Snake River Valley a Northwest wine region. The diversity of the Snake River Valley is embodied in the differences between the Sunny Slope, a very hot site, and the area of Kuna Butte, which is nearly akin to a cool climate region. 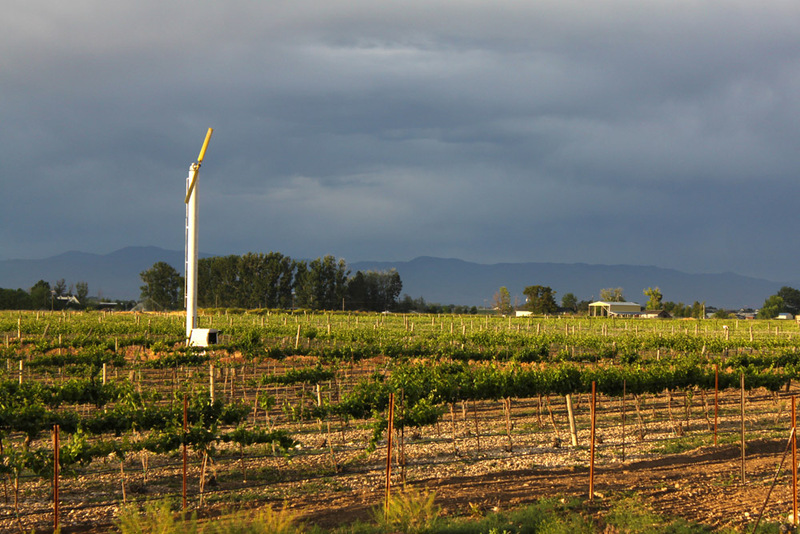 This variance throughout the AVA allows a variety of wines to be made in Idaho's wine country, from Cabernet to Viognier and from Malbec to Pinot Noir. 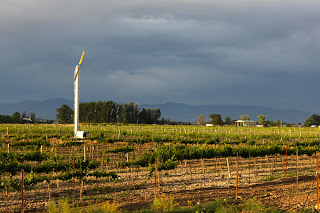 Bill ended up positioning his vineyard near Kuna, where the vineyard, planted on shallow soils atop a caliche limestone and basalt bedrock, has come to produce a reliable Pinot Noir crop that has become the signature wine of his small family winery. That Pinot Noir and the Stowe Vineyard itself represent the backbone of Indian Creek Winery. Bill and his wife Mui established a winery in what has become a small but very supportive wine community that their daugther Tammy and son-in-law (as well as winemaker) Mike have since taken on. For Mike, the reasons winemaking in the Snake River Valley is both exciting and worthwhile are those community connections and the intimate knowledge of the vineyards and fruit he has been able to develop because of the size of the community. While there are a few larger wineries in the area, most of the wineries and vineyards seen in the Snake River Valley are what might be described as "mom and pop" sized. This has created an ease in relationship building while also allowing Mike as the winemaker to really become acquainted with the vineyards and the fruit they produce. "Our Malbec comes from a one acre vineyard... and our Tempranillo from another small family vineyard. The fruit from these small vineyards is always the highest quality because it is given the vine by vine attention that it deserves. It isn't grown as a 15 acre block, each vine treated the same." As a developing winemaking region, the intimacy that the winemakers can establish with sites, varietal selection and growing practices will serve to represent the Snake River Valley and Idaho wines in general with the best possible wines they can craft. At Indian Creek the winemaker (Mike) is touching each vine three times each year. In addition to moderating the oak influence and letting the vineyard's true nature come through in the wine that's been made, Mike is also a part of primary decision making in canopy, trellising and picking of the fruit. The region is still young and by and large, distribution means showing up on the wine lists at local restaurants or at local boutique shops. While the area has seen rapid growth in the last few years, it hasn't changed the tight-knit nature of the wine community. The support from the local and Boise community has been substantial. For Mike and his wife Tammy they're carrying on the hard work and mission of Tammy's folks Bill and Mui. The result is a casual feel without the slightest hint of pretension. Mike points out that they understand that this is wine, it's not life or death. The small production and close family feel they and many in this wine community have generated often leads to them selling through all of their production via wine clubs or pre-releases - often while it's still in the barrel. What does make it to the shelves is often sold quickly to both locals and tourists visiting the tasting rooms. The approach at Indian Creek seems apropos for a region and market still seeking to define itself. An approachability coupled with a care and genuine desire to make the best wine that their region will give them. And how about the wine? Mike sent me three samples, their Viognier, Pinot Noir and White Pinot Noir, the latter made in a sweet style likened to a White Zinfandel. The Viognier displayed great aromatics, both fruit and floral notes made the scene. The front palate on the wine was prominent with lemon zest and lychee, and the wine trailed off quickly into a mineral rich finish. The White Pinot Noir was stylistically not a personal favorite (perhaps that's wine snobiness creeping in) yet it was not overly sweet at 2.5% residual sugar. It had notes of fresh cut strawberries and honesuckle, the palate was all rhubarb and those strawberries again. Mike noted that this is a very popular wine in the tasting room and they sell through it quickly. The final wine was clearly the star of the show and had the most character and substance of the three. The Pinot Noir displayed nice acidity and fresh red fruit character in a medium bodied wine. Aromatics of dust, sage and cherries gave it a nice earthy character to compliment the ever present fruit. It's clear that in Idaho they're making solid Northwest wines, and that it's a different region that has something unique to offer to the conversation. I've heard of some good wine being made in Idaho. Not surprisingly, I've never seen any in the Atlanta market to try.